Home » Analysis , Blogs , Border-Gavaskar Trophy , Featured Players , Team India , Test Cricket , Virender Sehwag » Should India Persist With Sehwag? 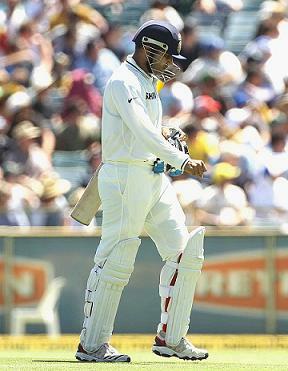 Should India Persist With Sehwag? One fine morning Sourav Ganguly and John Wright decided to take a gamble by sending a Test middle-order batsman to open the innings, unaware that their this move will revolutionize opening batting and the way Test cricket is played. The batsman I am talking about, of course, is the Nawab of Nazafgarh Virender Sehwag. Conventional wisdom says that you must respect the new ball, you must respect the bowlers for the first few overs. But that Sehwag never paid any heed to the traditional way and it has been evident since the day he was promoted to open the innings. He trusts only one style and that is his natural one. He has never had a great footwork or a great technique. Still, he has managed to score two Test Triple hundreds. His batting depends a lot on his hand-eye co-ordination and he has just one simple method - 'see the ball, hit the ball'. The last decade was an excellent one for Team India, especially as a Test team, and Virender Sehwag was one of the main reasons behind it. His fearless approach and his unique methods usually provided India an upper-hand from the very first ball and set the tempo of the game. Undoubtedly, this man is a legend and it's really sad to see where his career has headed in the last two years. He has struggled a lot, both with his batting and fitness and it has clearly affected India's preparation and performance in Tests. Yes, he did score a Test hundred and an ODI double hundred during this period but things aren't same as they used to be, which was evident when he was dropped from the Indian ODI side recently. They say we shouldn't make a habit of something which won't remain for long with us in the future. Virender Sehwag was that habit for team India and its fans: the habit of seeing him smashing bowlers all over the park and scoring big hundreds consistently. But now, that man is just another impostor, he is lost somewhere. Compared to his overall average of 50.05, he is averaging just 30.65 in this period. Clearly, he isn't going through the best of times at the moment. Even his average in the won and drawn matches has dropped down considerably. This tells us a story - he isn't contributing as much as he used to, he isn't contributing enough. Things just get horrible when you look at his away records since January 2011. An average of 18.78 for a Test opener is simply unacceptable and worrying at the same time, especially if you consider the task of redemption that lies ahead for the Indian team. The Indian team has to tour places like South Africa and England over the next year. Trying a new opening combination wouldn't be a good idea there. So, the big question right now is, if Sehwag fails in the first two Tests against Australia, should we continue with him or move on? There are youngsters like Rahane and Dhawan waiting in line and this home series against Australia is India's last opportunity to find a solution to the opening problem. Let's hope it is used well.